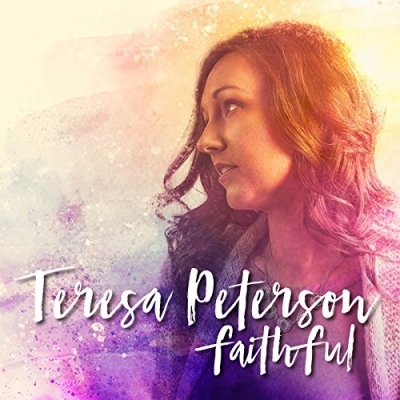 Teresa Peterson is a worship leader, speaker and singer/songwriter based out of Philadelphia, PA. Read on to find out more about this talented artist and her brand new new EP 'Faithful'. 'Deeper' is a fast paced and excitable praise song, very Taylor Swift, and the perfect introduction to Teresa's fabulous vocals as she sings "I'm calling out Abba, my Father, to you I surrender, standing on the edge of Your shore. I want to go deeper." I’m a Christian singer/songwriter, worship leader and speaker based out of Philadelphia, PA. My husband, James, and I travel around the country leading worship and giving concerts. It’s such a blessing to do ministry as a family. I come from a musical and worship-centered family, so it’s in the blood, I guess. I pursued secular music for 10 years, but I always loved leading worship. It took me a while to catch on that singing for the Lord was why I was created. I love singing in God’s living room, helping those grow one step closer to their Father. That’s how I view what I do, mostly. 'Faithful' is not as frantic as the opening track but still has an energy in it's reflective and worshipful reverence as it proclaims how faithful the heavenly Father is. Tell us a little bit about your new EP 'Faithful'? I tend to write from an autobiographical place, so Faithful really has come from my prayer over the last few years. I wanted to write an album that speaks life into barren circumstances. To joyfully press into the promises of God even though we have yet to reach a promised land. Like the barren woman rejoicing in Isaiah 54, I wrote Faithful as an anthem to who God is and who I am as His daughter. He’s so good! We wanted Faithful to be more of a ‘summer worship’ EP, so I hope those who listen to it are able to turn it up, roll the windows down and feel encouraged after listening. 'One and Only' is a softer, slower cry of praise, but as with all these tracks Teresa's excellent strong and clear voice leads the song masterfully whilst backed by a perfectly blended musical background. What's your favourite song on the EP and why? Oh! Tough question!! Sometimes it depends upon the day. Faithful is probably my number one. I just love everything about it, the lyrics, the tempo, the guitar tones, the message, everything. Deeper and One and Only are a close second, but Faithful is my number one. What do you think makes your music stand out from other Christian albums out at the moment? Writing an upbeat EP with depth I think can be a challenge. I really hope we accomplished that with this EP. I also feel that my producers helped create a record that feels current, but also fresh. I keep hearing feedback that it’s radio worthy and with its own sound. But in all honesty, I’m probably way too close to be in anyway objective. Oh wow. What an amazing question. Ahhhhhhhhh. So many to chose from. For the opportunity and all-time number one favorite: Neil Diamond. I was busting out his songs before I could read. I finally got to see him live last year and it was incredible. What a treasure. His work stands up across decades and genres. Runner up (secular): Ben Rector, no question. Worship: Anyone from Bethel Music. 'Where I Should Be' has a fabulous piano intro, repeated deliciously at intervals during this worshipful ballad. A hint of orchestral strings in the middle further enhances a simply beautiful track. You'll be sure to hit repeat on this one. Great segue! OK, influences: The two movies I was obsessed with as a kid was The Sound of Music and The Jazz Singer. I know I wasn’t the only one mesmerized by Julie Andrews, but I might have been the only one who would wake up screaming for Maria in the middle of a night as a toddler. If I woke up, I literally would not let my parents rest until that movie was rolling. (Sorry mom!) Her voice was able to capture and express such emotion and magic. She’s magic. Neil Diamond may not be the best actor, but the songs that he wrote for that movie have shaped my whole life and writing style. Love on the Rocks, Hello Again, America? I mean, come on. Amazing. Honest. Succinct. Powerful. All those key changes? I just love everything about it. The rest of growing up was filled with Christian and Country music, so I find I’m drawn to well-crafted lyrics. A really good hook is so satisfying and being able to convey so much with so little is an incredibly fun exercise. What I’m drawn to is authenticity, great story-telling and an ability to convey truth and emotion. I think that’s why I love worship music so much. When done well, it’s real, present, honest and vulnerable. I hope that’s conveyed in my writing. 'Your Voice' delivers a country-vibe with acoustic guitars and snappy percussion. It's hard not to be caught up in the happiness and reassurance as Teresa sings "All that I need to hear is the sound of Your voice, sound of Your voice, calling out for me." This answer has changed as I’ve gotten older. I have spent way too much time caring about being accepted and signed by a label and “making it” like I saw with acts growing up in the late ‘90’s. The idea is so seductive. But very recently, I’ve come to appreciate how the Lord has protected my creative freedom my entire career. I get to write, record, release and tour on my own terms and however it fits within our schedule. I have the opportunity to work with people I adore and trust and I get to help people grow closer to God. What a privilege. When I look at it through that lens, I am a rich, rich woman. This EP from Teresa is hugely impressive. There may only be a handful of songs but they are all instantly infectious and thoroughly enjoyable, with a highly talented singer delivering them. Brilliantly produced, this music has vast appeal with very much a current sound. I can't recommend it highly enough. Stuck in Manhattan? Definitely “Never Enough” from The Greatest Showman. The island of LOST and I’m about to be recruited into the Dharma Initiative? Or worse, being gobbled up by the Smoke Monster? America, Neil Diamond. What does the next year hold for Teresa Peterson? We are excited to be partnering with some great ministries this coming year and leading worship for their events! There’s also going to be a release tour for Faithful this fall. We’re excited to see fans we haven’t seen in a while and meet some new ones!